A month ago we said goodbye to the attendees of the second edition of the Three Acres Creative Gathering and here we are again, planning the third edition in October, in the season that better suits our mood and the desire to re-connect with our innate sense of wonder, our curiosity, our urge to share and be inspired, by other like-minded people and by Nature itself. Sometimes I wonder if it really happened. My life is usually quiet, but those days have been a whirlwind of emotions. We spent four days together in a cold Spring countryside, blessed by sunshine, green fields and blooming trees, but still charmed by a wood burning oven for the pizza, a hot plate of baked beans with fresh olive oil and the hug of a scarf, or of a friend. When you take part to our gatherings you instantly become part of our extended family of friends. I would not be where I am now, working crazy hours but doing what I love every second of my life, without the support of Regula and Sarka. We created our network when we needed to believe in ourselves, and since then we’ve been there to help, support, advice, inspire each other. But, most importantly, we’ve been there when it was time to celebrate a goal, a book, an award, and when it was time to talk a debacle out and learn from it. We opened our annual gatherings to other people because it felt good. It felt the right thing to do. Many friends have joined us along our journey, and each one of them made the gathering a little bit more special. We met Manuela during the first edition of the Gathering and now she is a dear friend. She touched us with her emotion, her love for bread. 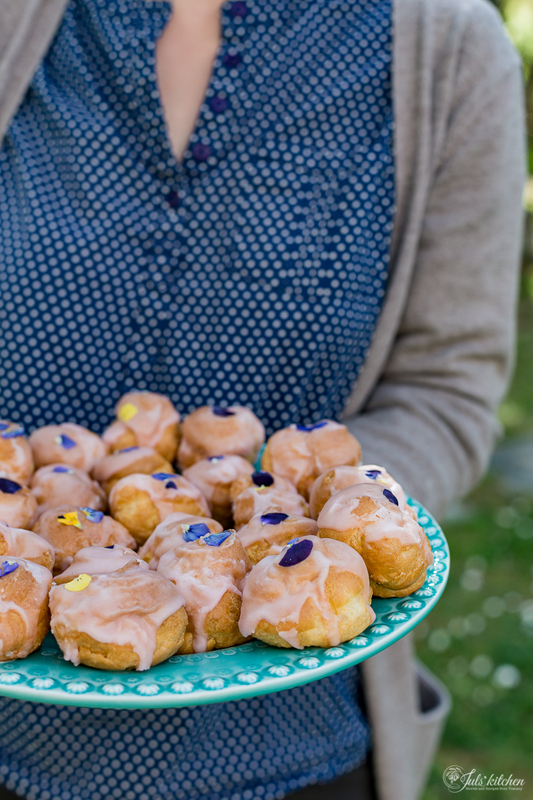 She taught us how to work with a sourdough starter. It is not a matter of flour and techniques, as everything is involved: heart, soul, dedication. Irene set the table for our final lunch foraging flowers along a country road: the beauty is everywhere, you just should be open enough to notice it. I thought she could not find any flower along that road, as I’ve been walking countless times there without noticing anything special: with her we found wild sage, wild pea flowers, tender oak leaves and elegant fennel fronds. 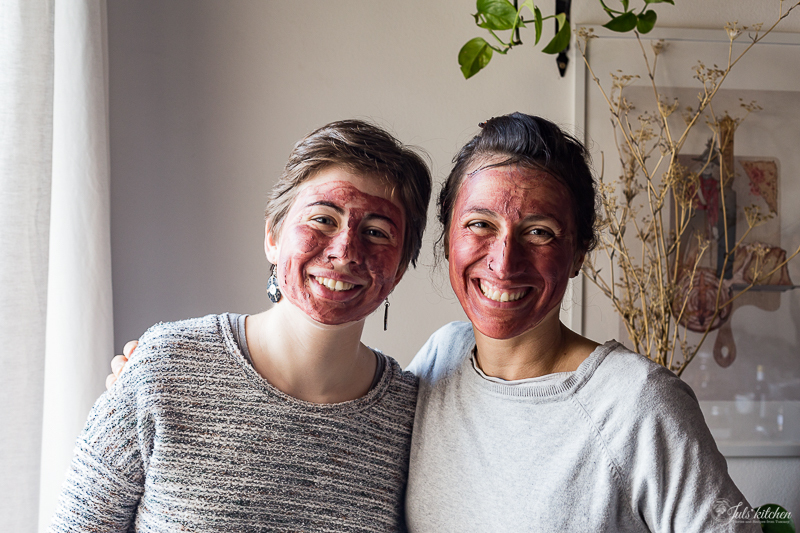 Claudia taught us ho to make a rose and pink clay mask with extra virgin olive oil and Damascena roses. Everyone got to try it along with her fresh tonic water. Tessa Kiros joined our gathering, too. You must know that she has been one of my main sources of inspiration through the years. Now I am proud to consider her a friend. Having her join us meant a lot, but it has been actually even more surprising and inspiring than I could expect. Her enthusiasm, her honesty and pureness got me so emotional that I began crying while she was talking after lunch at the gathering. It has been so liberating. 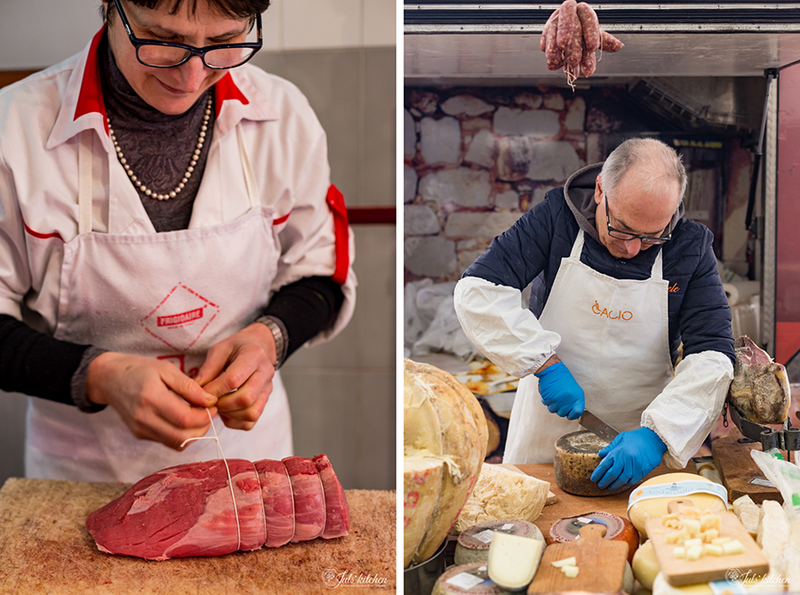 We’ve been to Siena with Laura, to San Gimignano, we visited the Mensanello farm, the market in Colle Val d’Elsa and my favourite butcher to buy all the best local ingredients for our meals. Cooking was a family matter. We cooked many meals, with the precious help of my mum and my grandmother, who made her amazing lasagne for our Sunday lunch. I learnt a lot about myself, my job and my expectations. I gave a lot in term of emotions, experience and dedication. Now it is your turn. 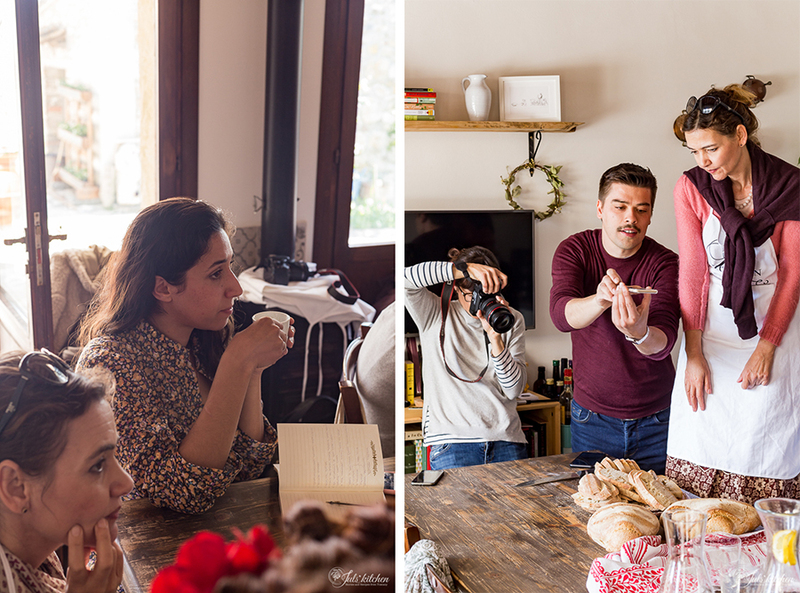 Do you want to join Tommaso, Sarka, Regula and me for our third Creative Gathering next October? You will stay at a lovely but basic agriturismo in the Sienese countryside on the outskirts of a tiny village with only a few houses. 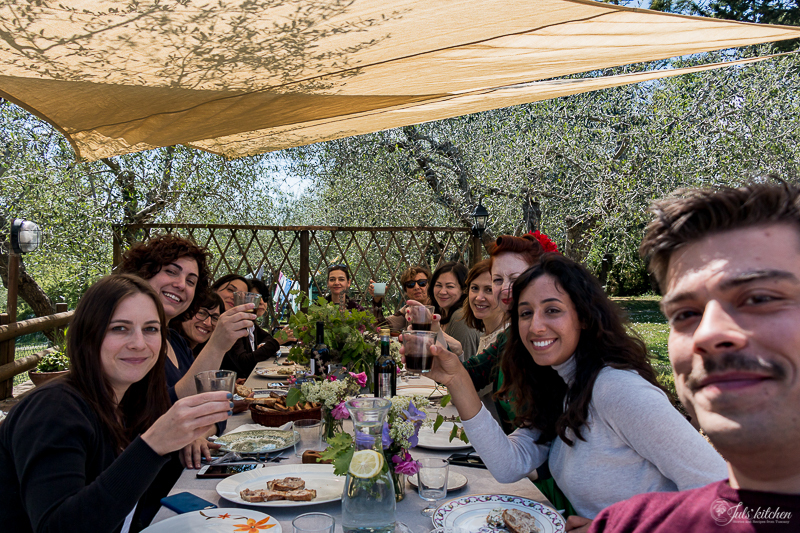 We will pick you up every day and drive you to the Juls’ Kitchen studio where we have been teaching Tuscan cookery courses and food expeditions for over six years. The studio is cosy and features a large open plan kitchen where will will cook and eat and drink copious amounts of tea. 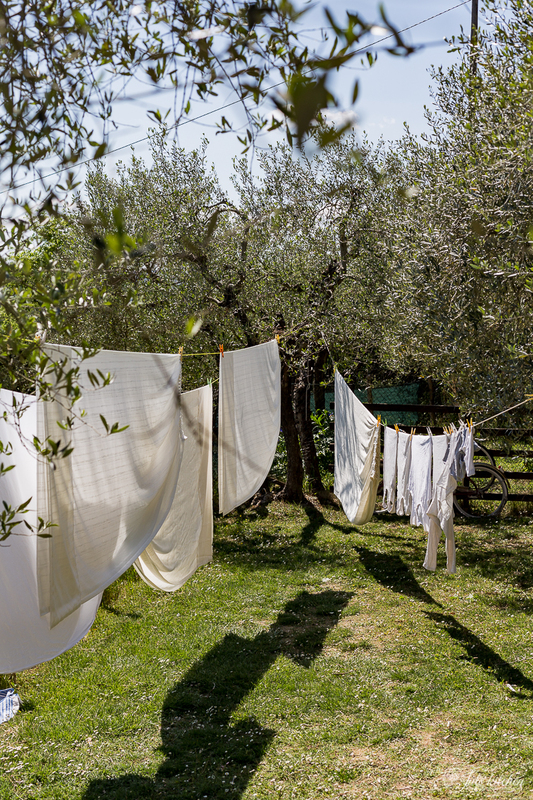 We have a lovely big garden there with wonderful countryside views, olive trees, a vegetable patch and the company of a Maremma Sheep dog and a black cat. We will light up the wood burning oven to make pizza, focaccia and bread, we will enjoy a spread of local vegetables and charcuterie to taste the real flavour of the countryside, we will walk under century old oaks to channel nature’s force and inspiration. This year we will have a special tour to a family run winery in the Chianti region with a real Tuscan wine lover, Rebecca from Grape Tour. 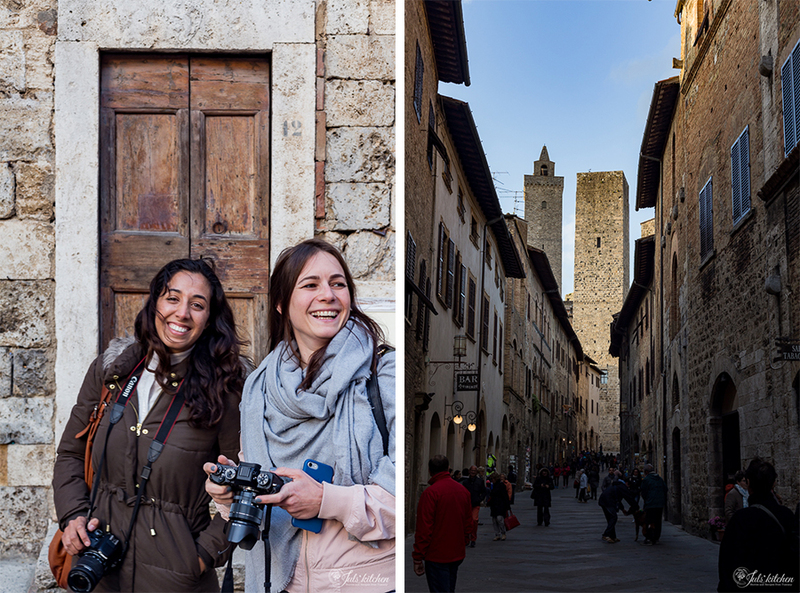 We will explore the charming Volterra, a town surrounded by a unique landscape, chosen in the past times by the Etruscan people for its unrivalled position and a slightly mysterious force, which you will definitely perceive while walking along its paved back alleys at dusk. 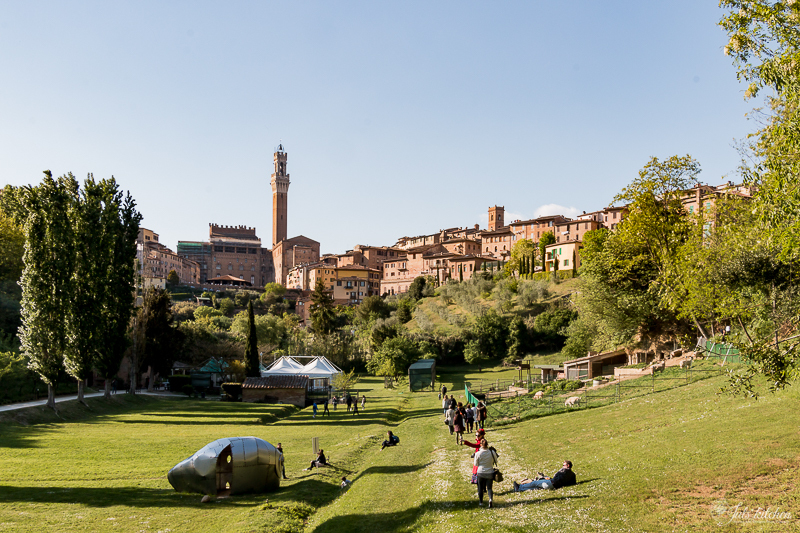 We will also head to Siena for a walk and dinner in one of the most well preserved medieval towns of Tuscany, with some free time to explore the town on your own and perhaps buy some treats to take home. We will have a sourdough bread making course with Manuela, who has been gifting us with the most fragrant bread since the first edition, and a DIY natural cosmetic workshop with Claudia, who’s been creating her beauty products from scratch for years: she uses just organic oils and butters, natural essences and a pinch of curiosity. As the Autumn colours change the foliage of woods, we rediscover our timeless love for chocolate: Kerrin will guide us through a professional tasting while talking about the path which let her to transform her passion for chocolate into an exciting career. 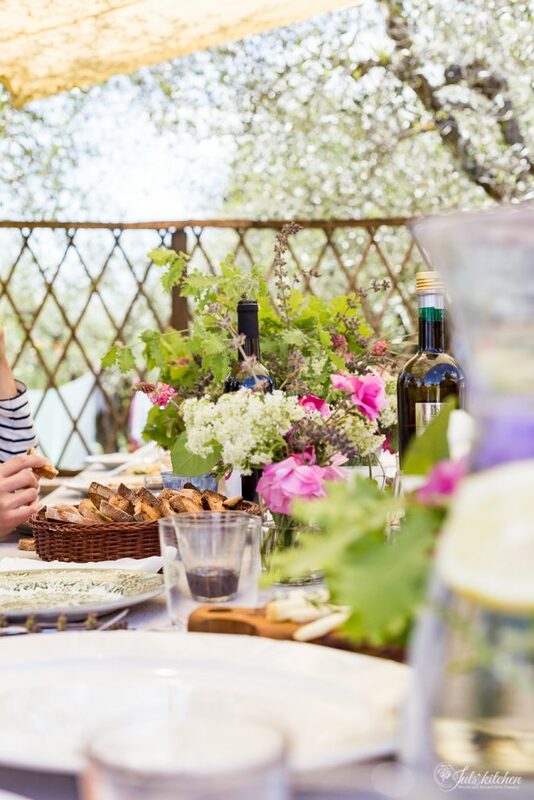 Tessa Kiros will join us again for a motivational talk on food writing, sharing her contagious optimism and all her experience as author of 10 cookbooks. We will also talk about photography, creativity, inspiration, life balance and commitment, all while enjoying honest seasonal food. There will be plenty of opportunities for each student to practice the techniques learned during the weekend. 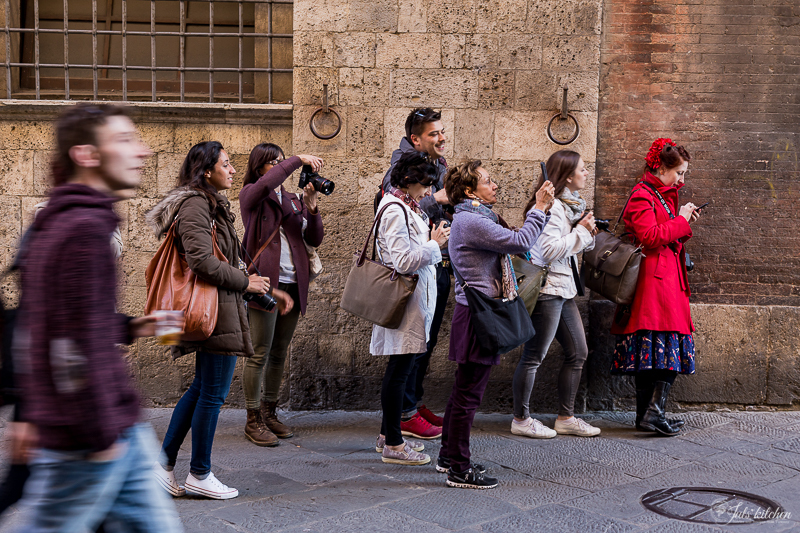 Book your flights as soon as possible as the gathering will be close to a national holiday in Italy, so everyone will be traveling during the long weekend. Due to the involved logistics, we offer no cancellations or refunds. Please know you can make it before booking. We strongly encourage you to have travel insurance to cover the retreat in the event of strikes, natural disasters, health problems, and other unforeseen events. **Option to book an extra night at the agriturismo if you want to travel back on Monday. You are welcome to join us for dinner at a restaurant but each will pay for their own. It is open to everyone, not just photographers and bloggers, but all creative people who want to explore different styles and deepen their visual voice. 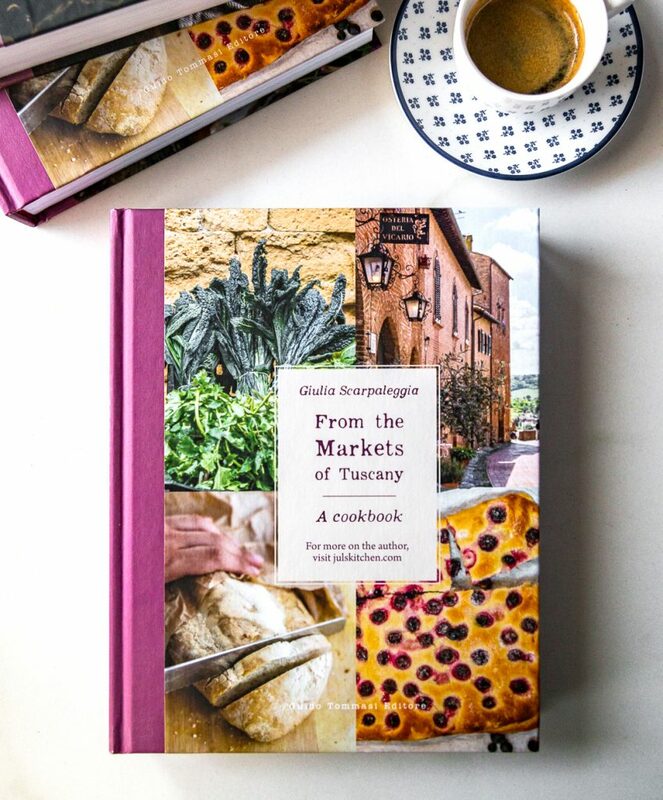 Regula is the author of 2 books on food and drink culture. She photographs and writes for a living. She is also a graphic designer. Her focus lies with reality, this can mean natural light or going on a fishing boat at 4 in the morning to capture the essence of a situation. Sarka has been a professional photographer for 6 years working with editorial clients in the UK and her homeland Czech Republic. She has been tutoring photography workshops for years and she is your go to girl for the technical part. Tommaso is the tech guy, Giulia’s partner in crime, a Social Media manager, amateur photographer and video maker. He is half of Juls’ Kitchen, managing the technical and social aspects of it. Proud official taster of everything that comes out of the kitchen. Mensanello, because your honest hospitality just rocks. Frantoio Pruneti, for the best Tuscan extra virgin olive oil for our pizza, salads, beans, cosmetics and gathering. Jing tea, for giving us the best tea for our tea breaks. Simone, Debbie, Sofia, Rachel, Shirley and Rosemarie who trusted us and enriched our gathering with their enthusiasm and curiosity. Tessa, Manuela, Irene, Lorenzo, Laura and Claudia for gifting us wit their expertise and passion. Luisa, Emiko, Linda and her family for joining us. I would love to join in this! 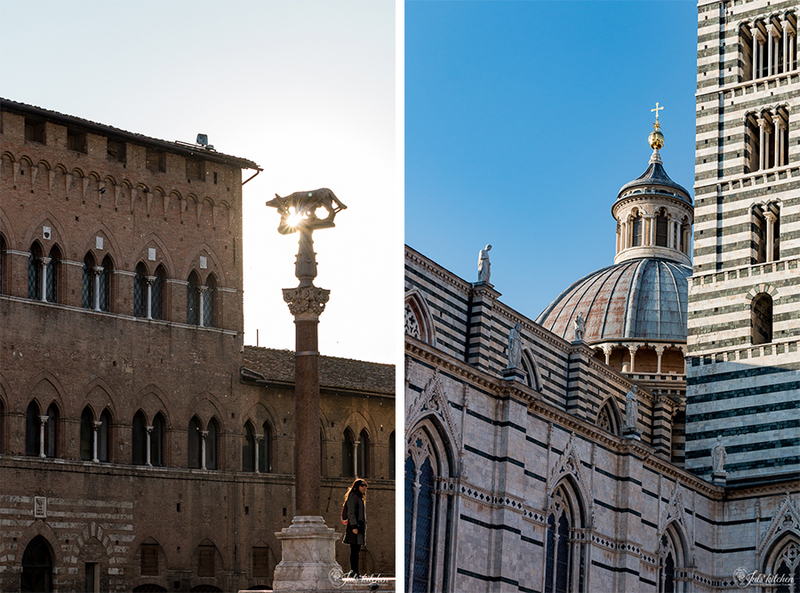 I live in Florence and paint, cook and am involved in other creative pursuits! Please include me! Oh Susan, it would be lovely to have you onboard! Just let me know if you need more info! Just send me details of where to be and when amd how to pay (my options are credit card or Transferwise!). My email is morningside_5@hotmail.com. Rispondo in italiano, che con l’inglese ci sto ancora lavorando (ma quel poco che son migliorata, lo sai, è merito vostro! ): ci son tanto sorrisi in queste foto, c’è l’atmosfera, si sente un’aria buona, leggera, portata da tutte le persone che hanno fatto parte di questi incontri. Non vedo l’ora che sia ottobre!